I have read plenty of articles and seen many videos where people write and talk about 'opening'* the cuticle to allow ingredients in hair conditioner to penetrate. This is supposed to be a key principle as to why you should pick a product labelled as a deep conditioner and also a reason to use increased heat when conditioning (wrapping conditioner soaked hair with a towel or using a hair dryer). Let me explain why the concept of 'opening' the cuticle is junk science. Scientists have observed that when a lock of hair is cut and preserved in a jar, it simply does not suffer the same wear and tear that hair which is on your head suffers. This is because it avoids being washed and the subsequent swelling that can impact the cuticles and cause them to chip away. 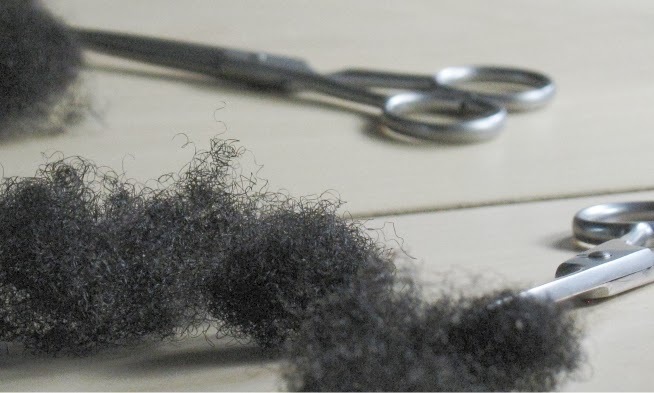 The strands also are not brushed or combed, again preserving the cuticle. Raised hair cuticles are common in relaxed or bleached hair and are in part the reason why these processes can make hair more fragile and susceptible to damage (Journal of Cosmetic Dermatology, pp 180-185, 2003). I would never regard a raised cuticle or 'open cuticle' as a positive. It is necessary and unavoidable for example you may need to wet your hair to moisturise it or you may use shampoo to cleanse your hair. Both of these actions do slightly swell and raise the hair cuticle . 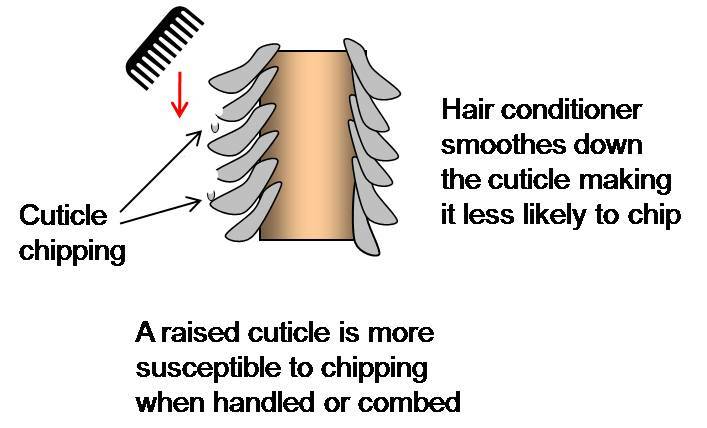 However, this is the reason why hair conditioner exists, to fix this problem (and it is a problem) of raised cuticles. This is also the reason why coconut oil as a prewash can help you have less damage. 2. The first action of hair conditioner is to smooth ('close') the cuticle. Human hair naturally has a slight negative charge and this increases further when hair is shampooed as shampoo contains surfactants with a negative charge. This has the effect of raising the cuticle slightly. Hair conditioner immediately acts to counteract this because it contains positively charged (cationic) surfactants. This action happens rapidly within seconds. Therefore, your hair will not be seating out there with raised cuticles waiting for substances to penetrate. Substances that can penetrate hair (see this post), do so because they have the right chemistry, i.e size, shape, charge and/or flexibility, to be able to get underneath the tiny space of a smooth cuticle. They do not require an 'open' cuticle to penetrate. * As a general note for those who are new to the blog, I do not like to use the term open and closed cuticles although these are terms widely used in the natural hair world and I am certain many of you understand what they mean. The cuticle really does not open, what it does do is raise itself from the surface. In place of open and closed, I use the terms raised and smooth. 2. If you are wondering, here are examples of cationic sufactants found in hair conditioner: stearalkonium chloride, cetrimonium chloride, dicetyldimonium chloride, behentrimonium methosulfate, behentrimonium chloride, stearamidopropyl dimethylamine, etc. Next Friday: Does penetration of an ingredient in hair conditioneractually make it more effective? So does this mean that you should not use heat to deep condition your hair, or that its not necessary? What if the confitioner step is skipped and a leave-in conditioner is applied instead? Do leave-ins have a positive charge as well? Leave ins do not tend to have the surfactants listed in the article above (some do though!). See the list in the article and reference it to the leave in you are using. 1) Hmmmm, I always like to clarify my hair before doing a deep protein or deep moisturizing treatment, and I find it leaves my hair very soft, airy, and easier to moisturize in the days following- especially after a deep protein treatment. Is this feeling really a feeling I like but a practice that is not healthy? What is the science behind clarifying as it relates to a raised cuticle? I do not think you are implying we should never use poos that aren't mild/non-ionic or zwitterionic surfactants in this post, however I would like to understand your position/scientific explanation on this. 2) Also, I think other oils work well as pre-poos. Is there something special about coconut oil that makes it a superior pre-poo? Other than its penetrating properties? Does anyone else here prefer another oil over coconut oil to prepoo with? 3) AND, 1 more question on mild shampoos. Your research on mild shampoos really helped me choose a staple shampoo by trashing the ones that were falling short… long story short, my hair dislikes Olefin Sulfonates. So, thank you for that. The question: My staple shampoo ended up being a Sulfate (S) shampoo. It is leaves my hair feeling less stripped than any Sulfate (S) I’ve ever used as well as any Sulfate Free (SF). How is this possible? I hate to ask such a general, loaded question, but I went from just thinking shampoos were just an unpleasant part of hair care ((S) poos) to finding I could dilute and use poos with ALS and ‘Cones (still using somewhat stripping (S) poos) to fining mild but less stripping Organix (SF but Olefin Sulfonate loaded) full circle to Sulfates Again! I know it lies within the formulation, but I was just wondering if there was any insight on “gentle (S) poos”. Thanks in advance, as always, this blog is great. 1. A mild non ionic/zwitterionic shampoo will always be gentler but it will not clean as well as something that has a negatively charged surfactant. If you are looking for really clean hair, you have to pick a better surfactant. I do not think that a harsher shampoo which cleans better is bad and the tendency is that it will not damage hair drastically unless you have bad practices like shampooing without conditioning or using an SLS/ALS shampoo daily or twice daily (some people can take this frequent washing but curly natural hair tends to start getting drier). 2. Coconut oil is the only one so far known to penetrate hair and prevent it from swelling when wet. This does not mean other natural oils cannot do the same thing but they are just not yet currently researched and reported. This is why I can only stand by coconut oil, many naturals do use other things to pre poo including other oils or even conditioner. 3. ALS and SLS based shampoos do become much gentler and even conditioning when you add silicones or SLES/ALES to them. The breakage rate of hair is reduced, I will have to find that journal and put up the research on the blog! 1. Thank you for your timely reply! Also, I am VERY MUCH looking forward to the research regarding “ALS and SLS based shampoos do become […] conditioning when you add silicones or SLES/ALES to them. The breakage rate of hair is reduced.” PLEASE address this soon! I HAND TYPED the ingredients list (the one listed on the website are largely different) in case it helps to extrapolate. I am very interested in the science of conditioning SLS poos because of all the marketing and product development (SF) poos receive. 2. For a very long time I’ve adopted hair care products/practices that make my hair “feel good” despite what’s going on in the blogwaves/airwaves and ruthlessly done away with products immediately that don’t. The only thing that would make me rethink an SLS poo is the belief of a Cosmetologist (and Chemist?) Blogger (Her website is “Killer Strands (dot) Blogspot (dot com)”) who believes the long term usage of SLS is a factor in female hair loss. Has any of your research implicated this? Ah, this Blog is like my Dessert! Thank you for your timely reply! Also, I am VERY MUCH looking forward to the research regarding “ALS and SLS based shampoos do become […] conditioning when you add silicones or SLES/ALES to them. The breakage rate of hair is reduced.” PLEASE address this soon! For a very long time I’ve adopted hair care products/practices that make my hair “feel good” despite what’s going on in the blogwaves/airwaves and ruthlessly done away with products immediately that don’t. The only thing that would make me rethink an SLS poo is the belief of a Cosmetologist (and Chemist?) Blogger (Her website is “Killer Strands (dot) Blogspot”) who believes the long term usage of SLS is a factor in female hair loss. Has any of your research implicated this? I've been trying to grow my hair and have been doing a lot of research on the best way to do this. Many blogs I have visited suggest doing a porosity test (dropping strands of your hair into a bowl of water). Apparently I have low porosity hair meaning my cuticles do not "open". However upon browsing your various blogposts it seems as though this might in fact be a good thing? I found this blog whilst searching for ways to "open" up my cuticles for better moisture penetration - most blogs ive visited recomend this. So what can you advise? If my cuticles are indeed "closed" should I be trying to manintain this? how can I fix my problem of very dry hair? and lastly what pH of products would you recomend? Welcome to the blog! You should scroll down the blog and see my post on porosity tests which are yet another example of junk science. I do not think you should 'open your cuticles' for better moisture. Cuticles are complex, they are multilayered and each layer is held together with lipids. Part of the reason hair becomes weaker in relaxing is that this lipid layer that keeps the cuticle 'closed' or compact is eroded. I suggest you try humectants in your leave in and proteins in your conditioner to help your hair retain moisture better. The ideal pH for hair products is between 4 and 7. Thanks for this clarification. I have seen so many references to "opening" the cuticle online and it seems most people are oblivious to the error. Like "Anonymous at 7.13" I have been skipping the conditioner step to save time. After reading this, I think a hot oil treatment may be another way to go when pressed for time. Just curious about cuticles. So the hair in the jar did not lose moisture over time- can we assume this is because it had no contact with air? How much moisture is necessary to retain moisture levels in hair that is exposed to the environment? I am sure this is subjective to the individual, but is there a more general guideline or a study of how long it takes hair to degrade in air? Thank you! I like your junk science posts- I was very suspicious of the porosity test there were too many variables in that eqn. thanks for posts like this. they are very helpful and truly appreciated! Thanks again for a great post. I had two questions, but one you already answered in the comments - it was whether heat during a deep conditioning treatment might have some benefit even if it doesn't raise the cuticle, it sounds like it could do. The other is - if you use a conditioner that smooths the cuticle but then rinse it out, does the cuticle remain smoothed until the next wash? Plus sorry, just thought of another - it is a myth then that conditioner should be rinsed with cool water and/or that hot water is damaging to hair? It sounds like a final cold rinse to close the cuticle is myth anyway. Thank you so much for the information. The bleach raised cuticle picture freaks me out though - that is my hair, no wonder it tangles. I first learnt about the idea of opening & closing or raising & shutting cuticles when I started reading about porosity. My hair is super super low porosity- so if I'm not raising cuticles, how do I get it to absorb anything? I'm having a bit of difficulty getting moisture in. Hi if that's how the cuticle works how does one keep moisture in their hair if they have low porosity and extra dry hair? I've been trying everything and my hair only stays moisturize for max 1hr.